Buildings are the most concerned element in landslide risk assessment. 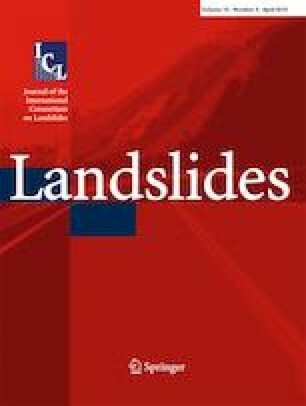 A weak link in landslide risk analysis is the evaluation of building response and vulnerability when impacted by a landslide. In this paper, failure mechanisms and processes of typical reinforced concrete buildings upon landslide impacts are discovered through an explicit time integration analysis in LS-DYNA. The Arbitrary Lagrangian–Eulerian formulation, which allows automatic rezoning, is applied to simulate the landslide flow dynamics and the impact into the building. Three landslide intensity levels are considered. Progressive collapse of the building is observed in the high-impact intensity case. The frontal walls are firstly destroyed due to its low out-of-plane flexural capacity, followed by the progressive failure of columns at the ground floor. The collapse of building occurs when the remaining load-bearing components cannot resist the superstructure loadings. Two plastic hinge failure mechanisms are observed on the damaged columns when the ultimate bending moments of the columns are exceeded at both ends. Finally, a five-class classification system is proposed to evaluate building damage states based on field observations and the numerical simulation results. The analysis helps robust building design and assessment of building vulnerability to landslides. The authors acknowledge the support from the Research Grants Council of the Hong Kong SAR (Nos. T22-603/15N and C6012-15G). where fy and fy’ are the tensile and compressive stresses of the longitudinal reinforcement, respectively; As and As’ are the areas of tensile and compressive longitudinal reinforcement, respectively; α1 is a coefficient of concrete grade; fck is the concrete compressive characteristic strength; b is the width of column section; x is the compression height; and h0 is the effective height of the cross-section. If x < as’, the compressive stress of the rebar does not reach fy’; so, the ultimate bending moment can be calculated by assuming x = as’ and taking a moment to the centroid of compressive rebar; Mu = fyAs(h0 − a’s) = 40 kNm. Snapshots of typical beam failure process from the numerical analysis are shown in Fig. 13. The development and distribution of cracks are described by the contours of the plastic strain. 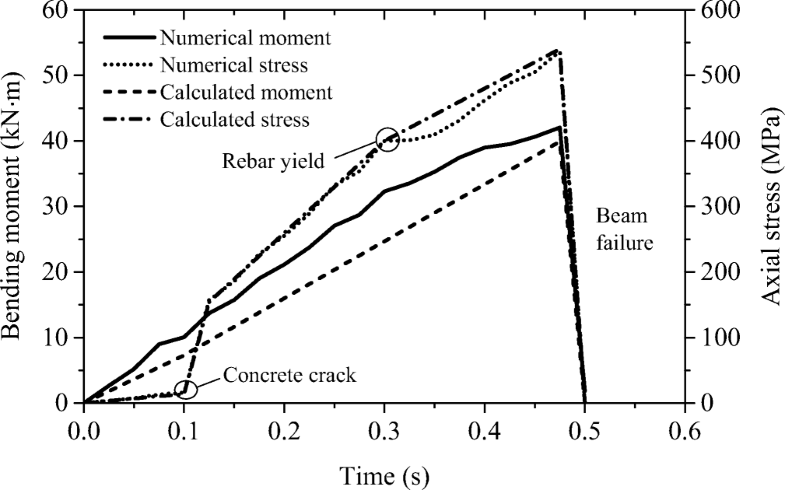 At 0.10 s, the cracking moment is reached, and, then, cracks occur in the tensile zone. Besides, the stress of the tensile rebar experiences a rapid increase at the crack point, from 16 to 157 MPa (Fig. 14). After cracking, the stresses of the tensile reinforcement and compressive concrete increase with the applied pressure, and, finally, the beam reaches the ultimate bending moment state. 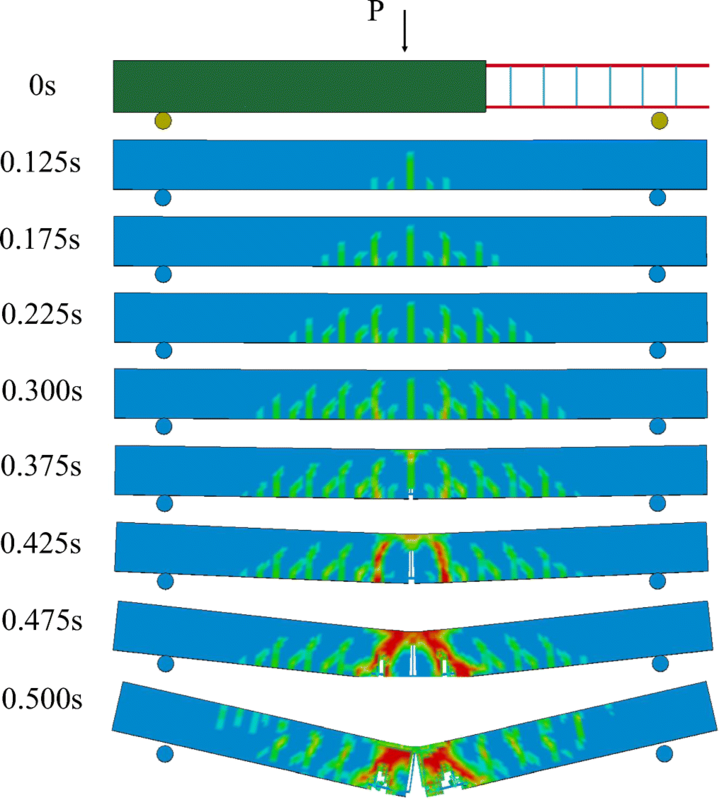 The numerical model reflects well the typical beam failure process, and the simulated results are very close to those from the static analysis. 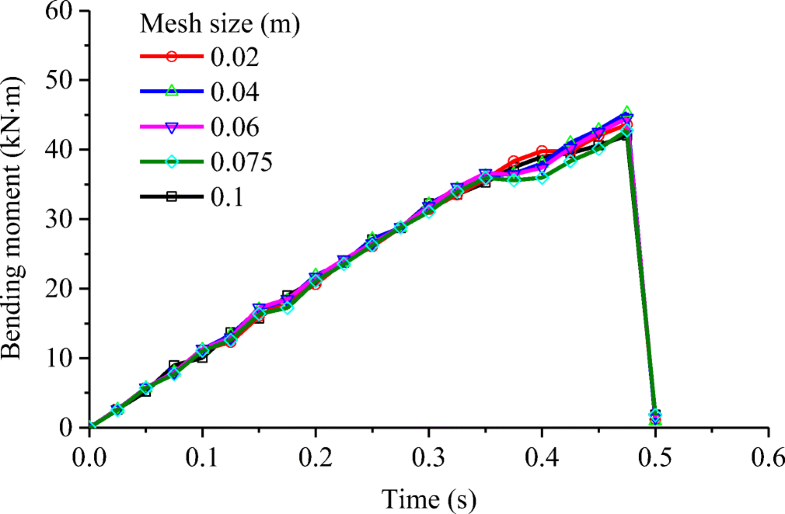 To consider the mesh size effect, the same three-point bending tests are simulated using different element sizes of the concrete beam. The time histories of bending moment at the middle section are compared in Fig. 15. The different element sizes almost produce the same results. Considering that the stability of the explicit integration scheme is determined by the time step, a smaller element size allows smaller time step to ensure a stable analysis and, thus, requires significantly longer computing time. 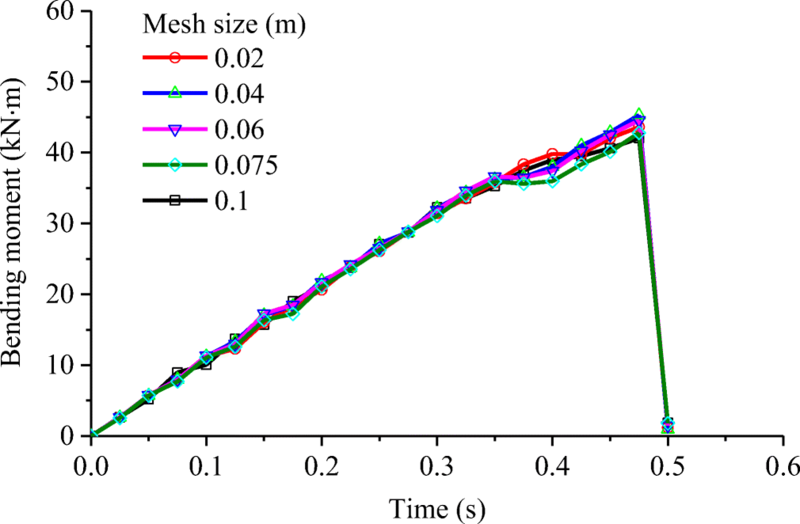 So, a mesh size of 0.075 m is applied in the impact analysis.